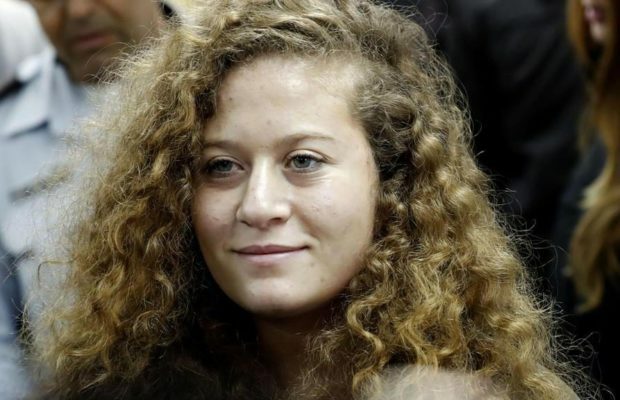 The Israeli military court, which is trying the young Palestinian activist Ahed Tamimi, decided last Sunday to try the 17-year-old girl behind closed doors in order to avoid the presence of the public and the international press, and decided, also with the utmost secrecy, to postpone the trial for the seventh consecutive time until 21 March. Ahed Tamimi was arrested in the courtyard of her home in the village of Nabi Saleh (occupied West Bank) on December 19. She is charged with 12 counts, including assault, (with fists and feet) on Israeli soldiers. If found guilty, she could be sentenced to between one and a half and ten years in prison. The girl was filmed facing two Israeli soldiers on 15 December, moments after another soldier shot a 15-year-old cousin of hers, Mohamed Tamimi, who was in a 72-hour coma as a result of the bullet impact, which left him with a head deformity after surgery. According to Gaby Lasky, 51, the Mexican Jewish lawyer defending Ahed Tamimi, the military court is “looking for convincing evidence” to be able to pass an exemplary sentence on the activist. Of the ten million Palestinians in the world, at least six million have been forced to leave their homeland because of apartheid and ethnic cleansing by Israel against its neighbors. Since Donald Trump recognized Jerusalem as the capital of Israel on 6 December, protests against the decision have resulted in the deaths of at least 20 Palestinians and the arrest of some 400 Palestinian children now being held in Israeli jails or detention centers.